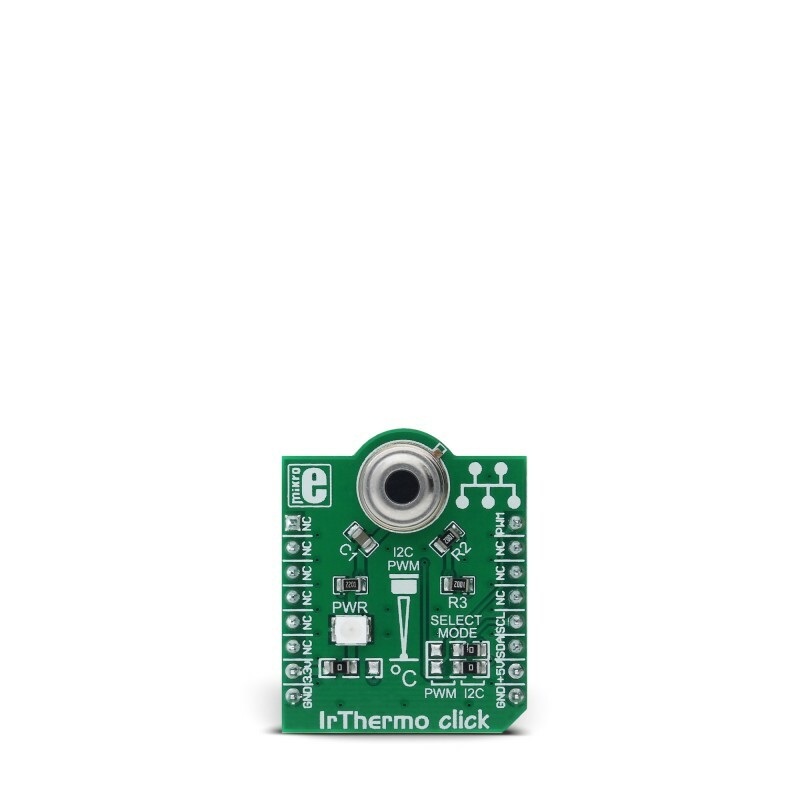 IrThermo click 3.3V is a contactless temperature measurement device that relies on the accurate thermopile sensor chip, which encompasses both the thermopile sensor element and the ASSP. The ASSP - signal conditioning circuitry features 17bit ADC and powerful DSP which allow high degree of accuracy and wide temperature measurement range. The IrThermo click is equipped with both the 10bit PWM interface and the SMBus/I2C interface. The main principle on which the IrThermo relies, is the measurement of the temperature by the contactless IR sensor MLX90614, from Melexis. This sensor is an IR sensor of a thermopile character. 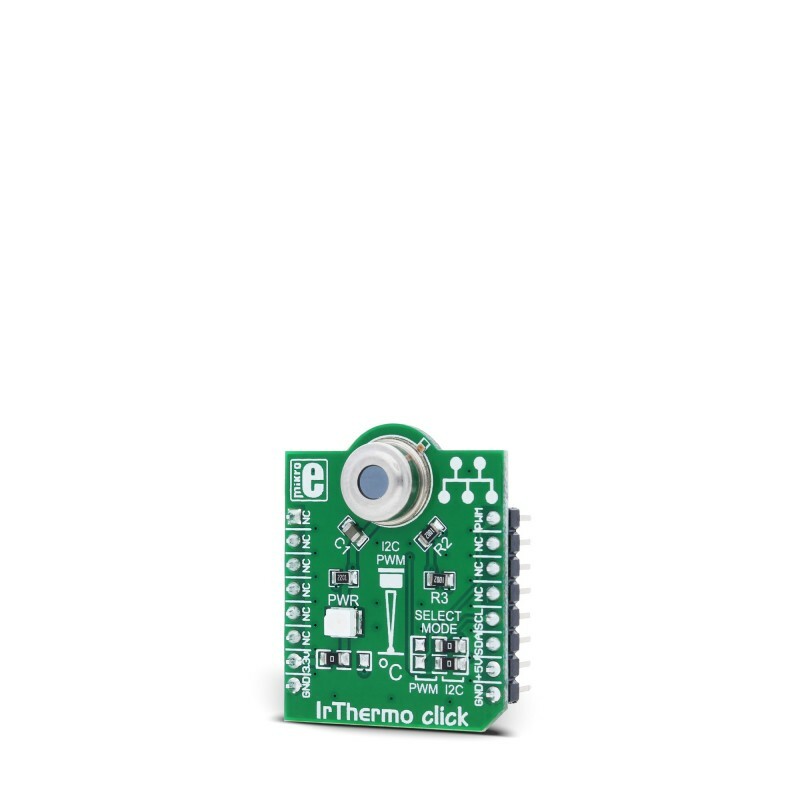 A thermopile sensor is actually a serially connected thermocouple array, with hot junctions located on the heat absorbing membrane. The cold junctions are located on a cold base, providing the reference point for generating the voltage. Due to the low-temperature capacity of the membrane, it will react to the heat radiation, generating voltage via the thermoelectric effect. The ASSP circuitry of the MLX90614 sensor, processes the voltage, allowing the accuracy of ±0.5˚C. The MLX90614 sensor is factory calibrated in wide temperature range: -40°C to 125°C for sensor temperature and -70°C to 380°C for object temperature. The ASSP circuitry also provides advanced interfacing options for the MCU, with the CRC error checking. 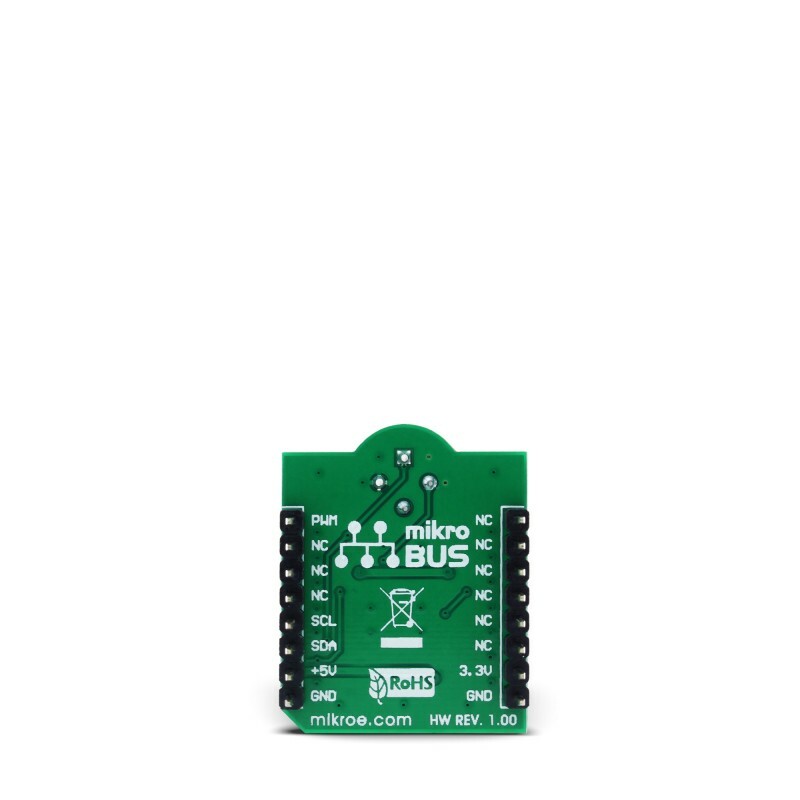 This table shows how the pinout on IrThermo click 3.3V corresponds to the pinout on the mikroBUS™ socket (the latter shown in the two middle columns). 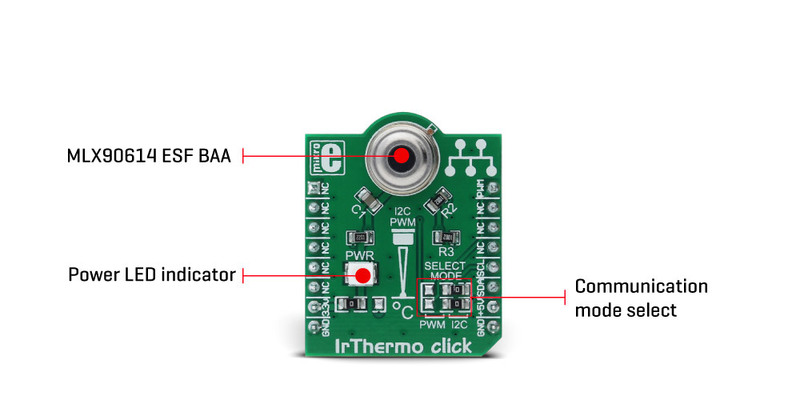 We provide a library for IrThermo click 3.3V on our Libstock page, as well as a demo application (example), developed using MikroElektronika compilers and mikroSDK. The provided click library is mikroSDK standard compliant. 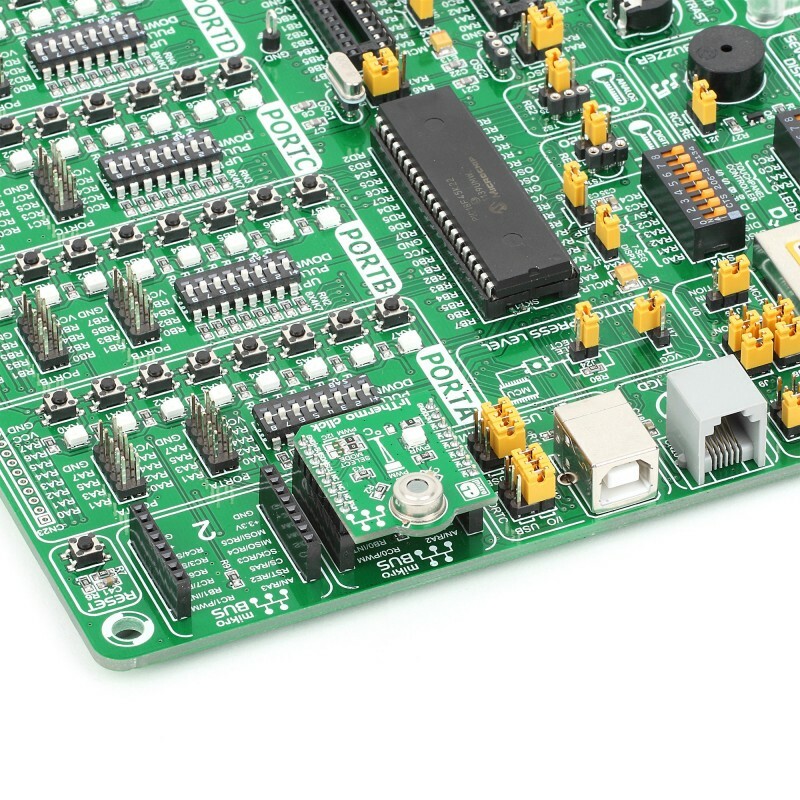 The demo application can run on all the main MikroElektronika development boards. float irthrm3v3_getTambient() - Returns ambient temperature value in Celsius. float irthrm3v3_getTobject() - Returns object temperature value in Celsius.